All novels need effective hooks: the reader should be interested to uncover more from the first page or (even better), the first line. The hook is typically a line or image that creates curiosity and questions that keep readers wanting to know more. Does it grab the reader’s interest by teasing some further discovery? Does it pose a question the reader will strongly want answered? Does it contain dramatic potential (a looming conflict, loss, discovery of something that will turn your main character’s world upside down)? Koontz’s opener uses the mundane details of the weather to create contrast with Harry Lyon’s murderous act. This makes it more shocking. So treat ‘rules’ cautiously. The important thing is that your opening line sets the mysterious tone for your story and grasps the reader’s interest. Looking beyond the first sentence, the first paragraph should introduce a little more sense of mood and atmosphere and intriguing setting and/or character. For the first chapter, favour brevity. If a reader feels they have to wade to the end of your opener, this could deter them from continuing. Leave clues throughout (so long as they aren’t too obvious). Include characters who are truthful along with those who lie, leaving it to the reader to decide whose information seems more honest. Have multiple possible explanations. In a murder mystery, that means having multiple suspicious characters. In a mystery adventure, it might mean having both natural and supernatural possible reasons for a character’s disappearance. In fiction writing, the term ‘red herring’ refers to ‘A clue or piece of information which is or is intended to be misleading or distracting:’ (Oxford Dictionaries Online). The term is borrowed from the custom of training dogs to hunt using the scent of dried herring, which turns red from being smoked. 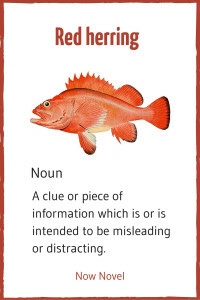 Red herrings can be scattered throughout your novel to keep the reader from guessing the culprit of a crime or explanation of a disappearance too soon. They escalate tension and suspense and make a novel more riveting. In Agatha Christie’s best-selling novel And Then There were None, ten people end up on an island and die one by one. Christie makes one of the remaining characters disappear, leading the other members of the party (and the reader) to suspect the vanished character of being the murderer, but there are further twists. A character who seems to be more suspicious or complicit than he actually is. An object that seems to have more significance than it ultimately will. An event that seems to be important to the narrative but turns out to be secondary. A clue placed by a villain (unknown to the reader and the main character) to send investigators down the wrong path of inquiry. Suspense in a mystery novel is key. What else can increase the reader’s sense of curiosity and anticipation? Having one speaker lie, giving information that contradicts what the reader already knows to be true. Have a character withhold information or be non-cooperative when questioned. Because we are perplexed by unexpected behaviour, use it to throw the reader and your characters off. A character who laughs mid-conversation, apropos of nothing, is a curious one. Employ dialogue with strange turns, interruptions, menacing tones or other elements that give the reader a feeling of unpredictability. Setting: An old cathedral might have a hallowed, restful feeling whereas darkening woods can be menacing or eerie. Descriptive language: Be thoughtful about the adjectives and verbs you choose. ‘She hastened along the narrow path’ creates a sense of urgency and spatial confinement or claustrophobia, both of which contribute to a tense and suspenseful atmosphere. Characterisation: What your characters say and do, how they look and what they hide all contribute to creating a mysterious, uncertain mood. Because the allure and fear of the unknown are the pillars of good mystery writing, it’s important to structure each chapter around unfolding discoveries expertly. While there should be rising action throughout the novel on a macro scale, within each chapter there should be some rising action too, as well as shifts in knowns and unknowns. 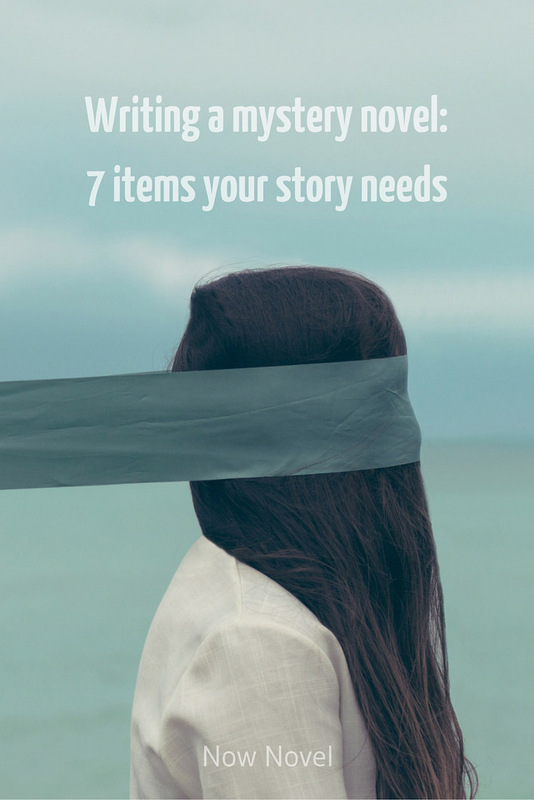 These are just a few examples of the way you can make a chapter riveting from the outset. End chapters on new discoveries that either bring the mystery-solving character(s) closer to finding the answer or create new questions. 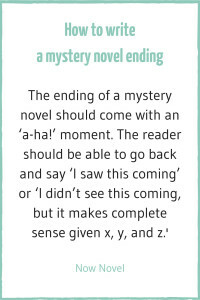 This push and pull between question and answer lies at the heart of the great mystery novel. 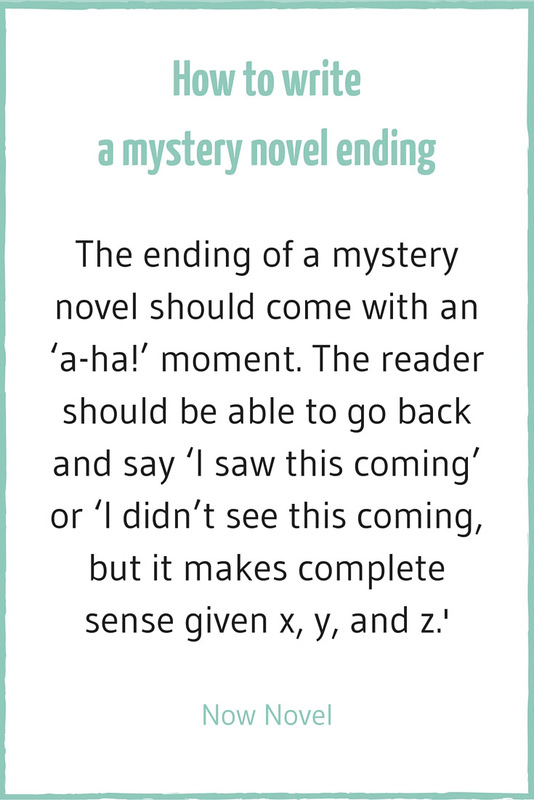 Nancy Curteman makes the crucial point that the ending of a mystery novel should come with an ‘a-ha!’ moment. The reader should be able to go back and say ‘I saw this coming’ or ‘I didn’t see this coming, but it makes complete sense given x, y, and z’. The identity of the killer, the cause for a disappearance or some other mystery explanation should not feel like a red herring itself. Writing a mystery novel demands that you pay attention to the ingredients of great mystery writing: Convincing plot and mood, mysterious characters, active involvement of the reader and more. If you’re ready to get going on your mystery novel, join the Mystery/Thriller writers’ group on Now Novel.